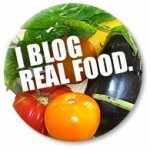 Welcome to day 22 of 30 Days to a Food Revolution. Today’s guest blogger is Erin. Nutrition, fitness and fun. These three things guide Erin in her journey through this world. She holds her Master’s degree in Physical Therapy, and Bachelor’s in Health Science. More importantly, she was diagnosed with celiac disease for over 5 years ago. She is an advocate of solid gluten free nutrition, and sound fitness habits to improve quality of life and health. Her goal is to assist and educate people in how to make positive and impactful decisions regarding nutrition and lifestyle. On her blog Gluten Free Fitness, she writes informative articles that make it easy to implement healthy habits and have a great time while you do it. Fuel. The word alone conjures thoughts of power. So often we forget. Food is the fuel with which we power our bodies. We get caught up in the everyday, mired in the mundane, stuck in the busy: and end up with whatever is handy in our mouths and bellies. With a little forethought and a tiny bit of planning, we can make it easier to fuel ourselves well. Think about it. Would you put low quality gas in a high performance car and expect amazing 0-60 times? Would you feed an award winning, money making racehorse low quality hay and expect it to win? Not going to happen. And probably not something you would even consider doing. Our bodies are incredibly designed high performance vehicles. And yet, for some unknown reason, we sometimes overlook using the optimal fuel. Breakfast is a common time for people to fall into poor fueling habits. Time crunched, starved, or not hungry-we all have our excuses. This not-really-a-recipe will make it easier to give your body the fuel it deserves. So what’s the deal with not-really-recipes? Well, I’m a bit of a kitchen nonconformist. I forget to measure-a lot. My Mom always cooked by taste and feel, and that seems to be either a genetic or learned habit-or both. I believe in cooking with methods-learn a way to do something, and then have a bunch of different ways to modify it slightly for new tastes. Hence-the not-really-recipe was born. A guideline-not a concrete, set in stone plan. This is a nice, easy way to get in a quality breakfast. I make a batch on Sunday afternoon so I have 5 portions for the weekdays-toss into a portable container and go! This makes 5 portions, approximately 20 grams of protein each. You could certainly vary the amounts to make it fit your needs, and add in all kinds of goodies. For a family brunch I added in some turkey sausage and low fat cheddar cheese. It just gives a good baseline to work with. 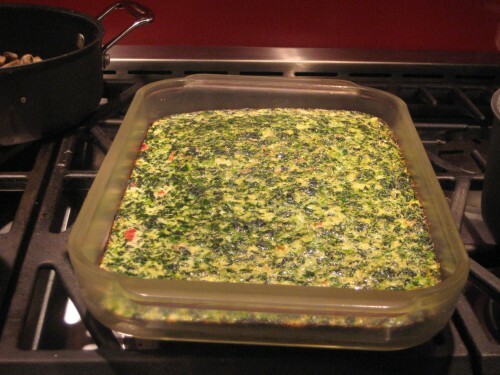 My breakfast always starts with some version of this high protein casserole. Then depending on the day, I may also have some gluten free oatmeal with berries and ground flaxseed. Other days I may add an ounce of goat or feta cheese. That depends on my activity level. If I’m more active that day, weight training, lots of activity, then I’ll go for the carbs as I’ve “earned them” so to speak. If not, maybe stay a little lower carb and go for the cheese, maybe add a piece of fruit. After you’ve cooked this up, separate it into equal portions, and the night before work I put into a Pyrex container. At work, micro for 1 minute and a half, and you have a portable, healthy, high protein breakfast to get you started. You get the idea. The only limitation to the number of ways you can modify this is the ingredients you have available. Go forth and enjoy! Embrace your imagination and creativity in the kitchen; fuel your mind and your body well. This looks great! I love egg whites with spinach! I have never made eggs ahead of time and eaten them later, but maybe a good idea for busy days to have this casserole made. I did a version of this last week, with steamed kale and a mixture of egg whites and eggs. It was great reheated even! I need to make a point of doing that regularly – it changes up my "must get protein" breakfast options – usually they're just hard-boiled eggs or nuts. I'd be excited about eating a "quiche" instead! Great tips – and I need to implement more batch cooking, like you mentioned! We'd be more likely to get chicken in our salads at lunch if I did them on Sunday nights for the week. This is exactly the blog post I was looking for yesterday before I new I was looking for it LOL. I am struggling with GF/DF and fitness. I can't wait to read more about your journey! Thanks for the recipe; sounds great! It would be a good dish to take to a potluck, especially a brunch potluck. It's a good way of adding extra servings of veggies into the day, since most people don't eat veggies for breakfast. The eggs heat up just fine and keep well, they actually do not get rubbery, believe it or not. Grab and go! I am not dairy free so sometimes forget about that aspect-feel free to give me a noodge now and again for ya'll dairy free folks! You're absolutely right-I've made it for several brunches. It's a great way to get stuff ready ahead of time so you can enjoy your guests/company/family. I love the food is fuel concept and I'm really trying to focus on that. I've been a little distracted and worried about my family being contaminated or getting sick. I'm shifting my focus to think about food being our fuel, not something to fear. This post is perfect timing for me! Thanks so much. What a great idea to incorporate kale! I’ll have to try that instead of spinach soon. Batch cooking is key for me-every week on Sunday a few pounds of chicken breast get cooked up either on the grill or roasted. This dish looks so delish and healthy! Glad this was helpful to you. I really think our mindset shapes our perspective in a big way-and moving from a place of fear (which is understandable) and taking control of that is a huge shift in mindset. Food can truly make us more powerful and focused, and can be our ally as well as our enemy. I often use the food as fuel concept. It simplifies life sometimes … no need to make it fancy, just get to the real food, tastes, nutrition, etc. But, your analogies are terrific and inspirational–thanks! I've never really reheated eggs, but this sounds like a great recipe to prepare in advance for a quick breakfast. Enjoy it! Let us know how it goes. wow, this looks great! Thanks for an easy breakfast that will keep everyone going and not looking for more food in an hour! I would love to give myself the freedom to not use recipes! @Michelle-Glad you like it! It's really nice to pop in the oven and have 30 minutes to do other things while it cooks too! Give it a shot! What's the worst that can happen, really?